The bill offered by Secretary of State Matthew Dunlap would prohibit the practice within 50 feet of entrances on Election Day. AUGUSTA — Activists who have led recent ballot question drives in Maine attacked a bill Wednesday that would ban them from collecting voter signatures inside polling places. But others urged the Legislature’s Veterans and Legal Affairs Committee to adopt the changes, saying at a public hearing that they didn’t like facing a gauntlet of people trying to collect signatures as they leave their polling places. “When I go to vote I appreciate seeing people from our various committees and organizations in my community, not paid petition gatherers who don’t live in my town, are probably from out of state and are funded by out-of-state organizations and out-of-state interests,” said Kathleen Nichols, a Falmouth voter. The hearing came on the first day of the second half of the 128th Legislature, which started its business with minimal fanfare Wednesday as well. Current law allows those collecting voter signatures to do so inside the polling place, but it does not require election officials to provide petitioners with any special accommodation. The law also gives local election officials the authority to have anyone disrupting the voting process removed from the polls. 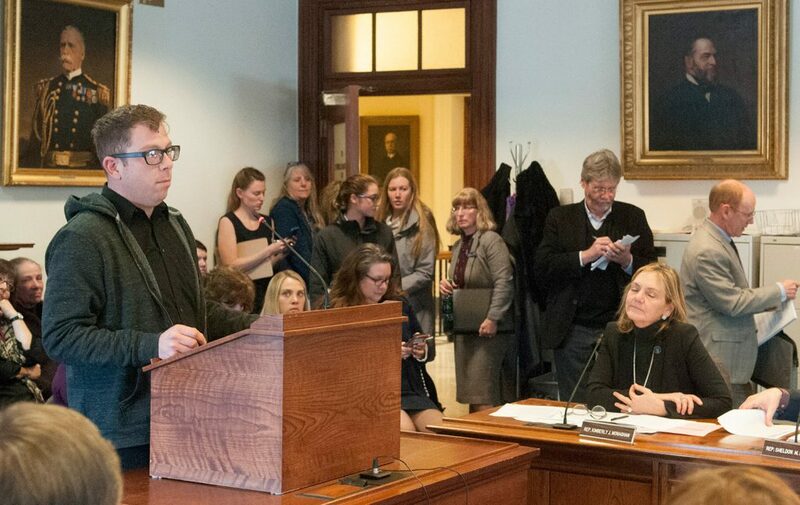 Among other provisions, the bill, offered by Maine Secretary of State Matthew Dunlap, a Democrat, would prohibit signature gathering and other activities – including non-political fundraising such as PTO bake sales – within 50 feet of the polling place entrance on Election Day. The bill also would prohibit candidates from greeting voters within that 50-foot zone. Currently, the law prohibits candidates from campaigning within 250 feet of the polling place entrance. The bill also would create a 50-foot politics-free corridor from the parking area to the polling place entrance. Opponents objected to the measure. They said that without the ability to collect voter signatures at the polls, only well-funded campaigns that can afford to pay petitioners would be able to collect the required number of voter signatures – currently just over 61,000 – needed to place a ballot measure before voters. The Ranked Choice Voting Committee is now gathering signatures to put a people’s veto on the ballot for June, after the Legislature passed a law that will postpone ranked-choice voting in Maine. The law would repeal the citizen-passed law entirely in 2021 if an amendment to the state’s constitution is not adopted by then. Deputy Secretary of State Julie Flynn told the committee that the bulk of the bill before them included important technical changes to existing voting law. She said the Legislature should move forward with those changes even if lawmakers opposed moving a number of activities outside of the polling place. Flynn also advised the committee that similar limits on political activity in the polling place in other states have survived legal challenges. “Content-based restrictions on political speech have survived and can survive a constitutional challenge only if it is necessary to serve a compelling state interest and is narrowly tailored to achieve that end,” Flynn said. She said the U.S. Supreme Court already has ruled that states do have a compelling interest in guarding against voter intimidation in the polling place, as well as guarding against voter fraud. Flynn also suggested the committee may amend the bill to make the restricted zone smaller. Other New England states have similar limits on polling place activity, but their zones were smaller than Maine’s current 250-foot restriction zone. She said New Hampshire has a 10-foot zone, Massachusetts a 150-foot zone, Connecticut a 75-foot zone and that Vermont only banned political activity inside the polling place. “We believe that keeping all the non-voting activities out of the voting place itself and out of a protected corridor leading to the entrance to the polls from the parking or drop-off area is the most defensible statutory approach and would be possible to administer fairly and consistently across the state,” Flynn said. The proposed changes are meant to maintain and restore order to the polling place, Dunlap said, noting that the bill was prompted in large part by concerns among election officials in Maine cities and towns. 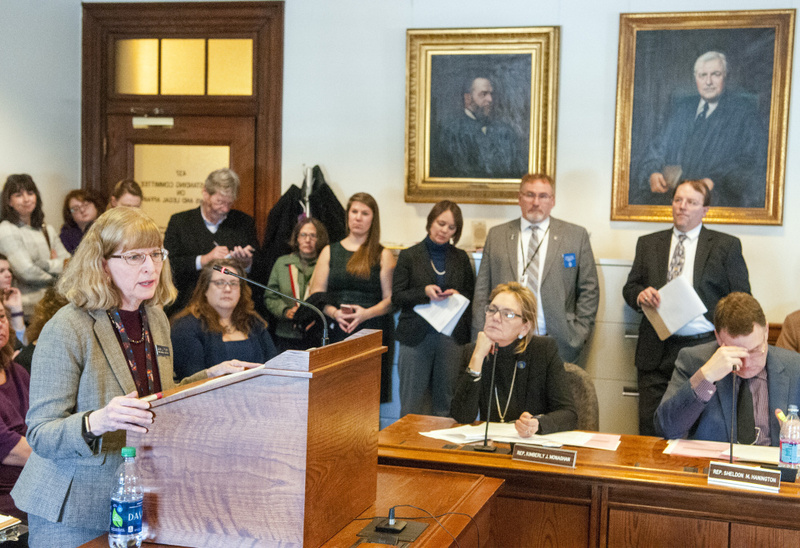 Waterville City Clerk Patti Dubois, the chairwoman for the elections working group of the Maine Municipal Clerks Association, told the committee Wednesday that the clerks association had not asked for the law change. Lawmakers took no action on the bill and will hold a work session to consider possible amendments before voting on a recommendation on the bill for the entire Legislature. That work session has not yet been scheduled.